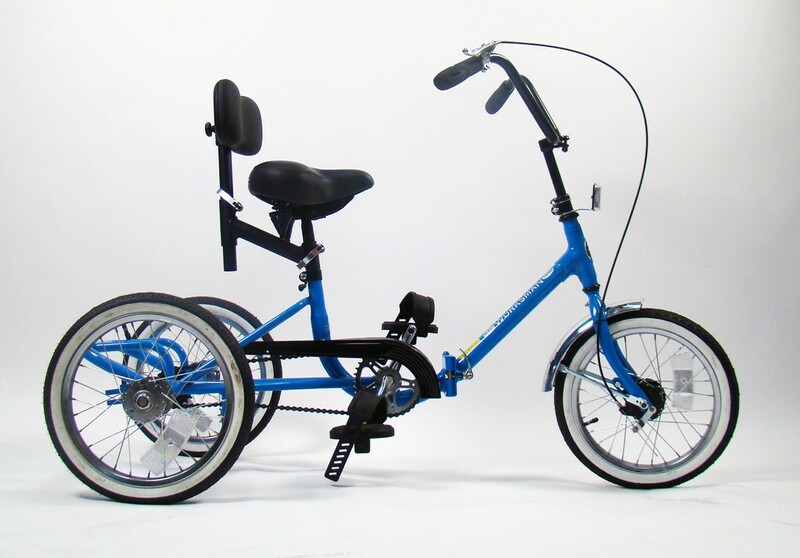 Taking the same design features on our famous adult trikes, we recently introduced the all new TR16 Series of Developmental Youth Trikes. The TR16-CB features a folding frame for easy storage and take-along ability, short frame style with easy step-on, comfortable padded saddle, adjustable handlebars and seat post, rear basket and much more. The sturdy 16x1.75 wheels give this cycle a low center of gravity for excellent balance. The TR16-CB features a front drum brake and 1 speed coaster (foot) brake. Ideal for children ages 3-8. Ships mostly assembled via UPS. Minimum inseam 17". Shown with the N16 pedal upgrade and backrest upgrade. Received the smallest trike for our five year old son. It is simply AWESOME. He was born profoundly deaf but has cochlear implants. His hearing, cognitive development, gross motor skills and vestibular system were severely affected by a virus called CMV that I contracted when I was pregnant with him. It took him two years of therapy to walk, another two to learn to ride a modified toddler tricycle, and we had almost lost hope that he would ride again after he outgrew his bigger radio flyer tricycle. 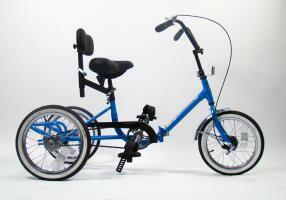 We couldn't be more thrilled about this trike, the quality of workmanship and design! A million thanks!